We’ve all been there… it’s 9pm on Friday night and you’re checking through your emails, only your heart isn’t really in it. You should be switched off & relaxing by now, but there’s over 30 new emails to sort through most of which came in today! I get it – I really do! 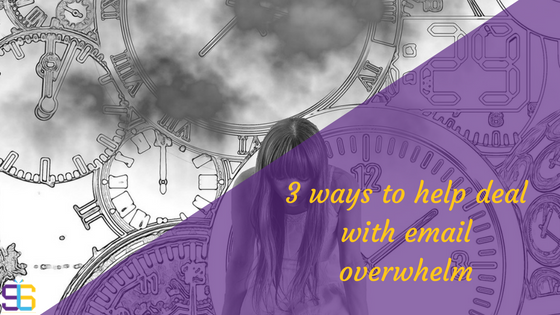 I used to feel a sense of panic rising in my chest when I logged into my emails & saw so many of them unanswered. What would people think of me? Would they think I’m deliberately ignoring them? Would they think I don’t need their business? First things first, get yourself into a set routine of when to check your emails. If you know you have an hour free mid-morning each day, in between clients, set yourself 30 minutes then to go through any emails that have come in. If you don’t want to respond to any then, use this time to flag any that need responding to first, so you can get straight into it the next time you’re checking through them. When you do go through your emails, make sure you’re 100% focused on them. Switch off any notifications from social media accounts. When we check emails, it tends to be a task that’s done alongside something else, or we casually look through them whilst we’re on the phone. Be disciplined and give your emails the time and focus they deserve. I generally check my emails 3 times a day – first thing in the morning (before I know my clients are working), lunchtime and again around 4pm (so I can catch any queries that have come in from clients). I know this doesn’t suit everyone so try to find a good balance for you. Remember it’s not set in stone though. Try a routine for a couple of weeks and if you find a certain time isn’t working for you… change it! This has to work for you. Although I don’t actually use an autoresponder any more (except if I’m away), this tip was a life-saver for me a couple of years ago! We seem to be in a mind-set that we must reply to an email as soon as it comes in… that the person at the other end is sitting waiting for you to respond, and as the minutes tick by their feeling of disappointment is getting worse! Of course, deep down we know this simply isn’t true! One way to overcome this mentality is to set up an autoresponder advising people that you’ll reply within 24 or 48 hours (or whatever works best for you). Or you could set one up saying that in order to maintain a high level of service to your clients, you only check your emails once a day at 6pm (for example). Not only does this relieve the pressure on yourself to reply straightaway, it also lets the sender know not to expect a reply from you for a couple of days. This last tip is one I’ve set up for myself and love it! One of the things that used to really stress me out was the number of emails I had in my inbox and this feeling would only increase as more & more emails came in throughout the day. By setting up filters it’s removed a lot of those emails coming into the actual inbox. So, how do I work it? I’ve set up filters so that if an email comes in from a client it automatically goes into that client’s folder. This means anything that appears in my inbox will be a new enquiry or from someone who isn’t a client. It also means that when I click on to my client’s individual folders, I am totally focused on that client and their emails rather than flitting between each email from different people one after the other. Another strategy you could use is the Five Folder method as recommended by Fast Company. I haven’t tried this one myself and it looks like it could take a bit of getting used to, but that doesn’t mean it couldn’t work for you! Another way of minimising the number of emails we receive is to unsubscribe from any newsletters that you automatically delete or don’t read. It literally takes a few seconds to click on the unsubscribe button and submit your reason why. This is a no-brainer for me! I had so many emails coming through that I never clicked on… I just used to delete them straightaway without opening them but they still added to the number of emails in my inbox. So, now I’m very strict with myself and I unsubscribe to any that I haven’t read in the last 2 months. 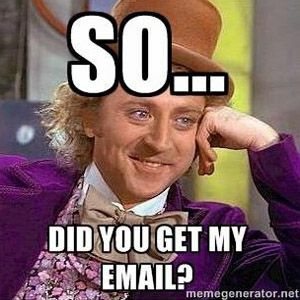 I came across this great article which lists 13 email management best practices. There are a couple in there which I’m going to try myself! I hope the above tips have helped in some way, let me know in the comments if you use any of the above methods or if you have any other tips to add.